De eerste is door een reeds bestaande fiets te nemen en er een motor aan toe te voegen, of de tweede manier is door eerst de motor te nemen en er een nieuwe fiets omheen te ontwikkelen. De meeste e-bikes die je tegen komt vallen in de eerste categorie. De Hongaarse firma Gepida bouwt e-bikes volgens de tweede manier en is begonnen met het nemen van een krachtige elektrische Bosch motor en hier een nieuw fietsframe omheen te bouwen. Dit is in mijn ogen de enige en beste manier om een goede e-bike te bouwen. The Gepida Alboin 1000 e-bike, with its 250W Bosch motor, caused me to cheat on my significant other. The significant other, for the purposes of this review, was the Cell Akuna carbon fiber road bike that I was riding for an extended bike review. I had promised to do all my road riding on the Akuna for the length of the review, so I was surprised when BNA’s publisher, Christopher, told me he wanted me to test ride this bike. He said it was “different”, so my curiosity was piqued. I have written a few e-bike reviews for BNA (The bakfiets Dutch cargo bike and the Gazelle Orange Plus Innergy XT), ridden a few other e-bikes, and contributed to an e-book on the subject (E-Bike Buyers Guide). All of the bikes I’ve ridden have been of the “adapted bike” variety where the motor has been in either the front hub, the rear hub, or connected to the frame and powered the bike via a secondary chain. I hadn’t even considered the possibility of having an “integrated bike” with the motor actually part of the bike, which is the path that Gepida have taken with their e-bikes. They’re not the only ones to be taking this approach; Gazelle, another large European e-bike manufacturer, is now also producing these mid-drive bikes, and also using Bosch motors. Gepida start with a motor, in the case of the the Alboin it’s the Bosch Active Line motor (there is also a Performance Line motor which I’ll discuss later), and they put it at the lowest point of the frame, the bottom bracket. This makes sense because it’s the heaviest component on the bike and having a low center of gravity offsets some of the effects of that weight (hub motors are at a similar height for the same reason). The motor directly drives the bottom bracket axle and chain ring, which means that when they say pedal assist, it actually is pedal assist; I’ll talk about this more in a little while. The rest of the bike is then built around this motor and the result is something that looks a bit weird at first glance, but isn’t horribly ugly at all. The bulky (but very powerful) motor doesn’t make the bike feel weird to ride at all; the pedals are still the same distance apart as any other bike, so you don’t even notice you’re riding anything different. The aluminium framed Alboin, aside from the motor, is a pretty standard “upper-end” commuter 29er. It has a Shimano group set (mainly Deore), hydraulic disc brakes, Schwalbe Energizer 700C x 35 tyres, SKS mud guards, a pannier rack, kick stand (which is one of the nicer ones I’ve used, a Pletscher ESGE), and a Selle Royal Ariel saddle. 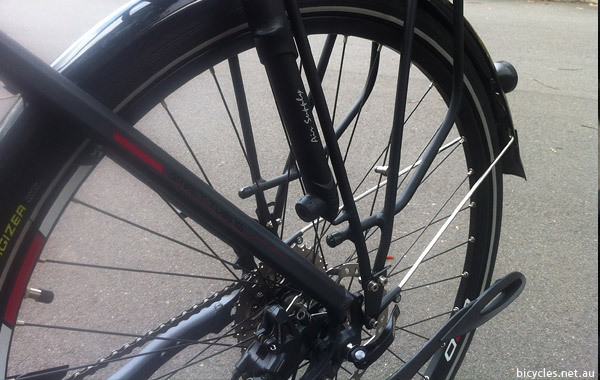 The model I trialled had a front wheel hub dynamo powering front and rear LEDs which were suitable as “be seen” lighting, and as such suitable for city/suburban riding. I can’t comment too much on the Suntour suspension forks with the 50mm travel since I have a severe allergy to suspension forks for road riding and always lock them out for commuting, which these ones handled nicely. The electronics on the bike consist of the 250W Bosch Active Line motor, which can produce up to 48 Nm of torque, the 400WH (11.0 Ah) Lithium ion battery, which mounts on the down tube, and the display unit, which mounts in the middle of the handlebars where the stem and bars meet. All of these components can be removed and replaced or upgraded separately, which I’ll discuss more later, and only take a little bit of adjustment to get used to; you will have to mount your Garmin a little differently, and you lose your primary bottle cage mount position. The e-bikes I’ve ridden before have had the battery mounted on the rear rack due to the battery size, but mounting the battery on the down tube does make a kind of sense (i.e. you can get rid of the rack for sportier model bikes) and you have the seat tube to mount a bottle cage on anyway. The battery clips in to a custom mount and locks in with a key. You can keep the key safely at home since you won’t have to remove the battery very often, if at all, since you can charge it while it’s on the bike. I had to only charge it once during the week I had it and it only took just over 3 hours to get to a full charge, which is quite impressive given the amount of work you get out of that. Battery life can be seen through the display unit and also as a series of LEDs on the side of the battery itself. 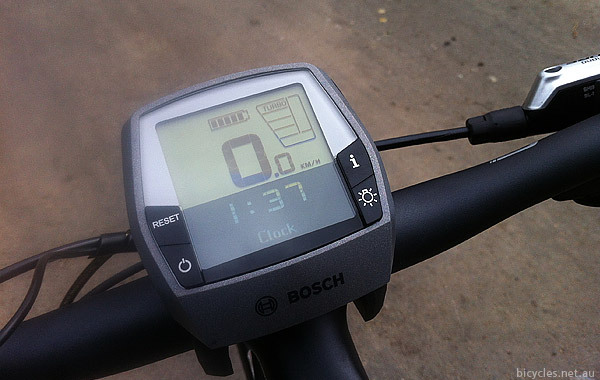 The head unit displays typical trip computer information, such as your current speed, the distance traveled, and so on, plus it also displays the mode your bike is currently in (more on that later) and how much distance there is until the battery is drained. This will depend on how you’re riding and how much assistance you’re getting. The controls are intuitive and straight forward, required no instruction (though an instruction manual is provided), and only took a few seconds of experimentation to master. I began this review by comparing Gepida’s build philosophy with the standard method of e-bike construction, and the difference deserves a bit of discussion. If you read my previous e-bike reviews, or if you read the e-book on e-bikes (see links at the top of the article), you’ll notice that two recurring concerns I have with e-bikes are the transportability of the bikes and the repair of tyres if they go flat. Both of these issues stem from difficulties in removing the wheels, or more precisely removing and reattaching the electronics on the hub motors. I’m told it’s easy once you have practiced it a few times, but frankly it’s one more thing I don’t want to worry about. With the Gepida, you don’t have to worry. One of the main things I like about this bike, and this build style, is that everything save the cranks are normal bike parts. The wheels come off like normal bike wheels, because they are normal bike wheels. That means changing a flat is as easy as it is with any other bike. Granted, the model I rode had a dynamo hub, but that’s not necessary for the e-bike to work; I could have put any 29er disc wheel on the Alboin and it would work. So when your mate is selling his set of super-light magic wheels, you can buy them and use them on the Alboin. If the handlebar grips aren’t to your liking, you can change them. Want to upgrade to an 11/12/whatever speed group set you can change it. Don’t like the brakes, change them. Actually, if you buy this bike from the Australian distributor, Eurocycles, you’ll already have upgraded brakes since the importer, Rick, didn’t like the stock brakes, so when they were changing the brakes to the Australian configuration (right hand lever = front brake) they changed the brakes completely. Having a mid-line drive also makes a difference to the transportability of the bike. This was driven home to me when I actually drove home with the bike; wheels off of the bike, into the back of the van, wheels back on the bike, ready for riding. Sounds easy, doesn’t it? Well it was, but I’m glad it was do-able because trying to mount this bike on a rooftop would have been a bit of a challenge. The bike, with battery, weighs just over 25 kg, which is more than my roof mounted rack can handle, and getting it on top of my van wouldn’t have been fun even if I could carry it in that location. 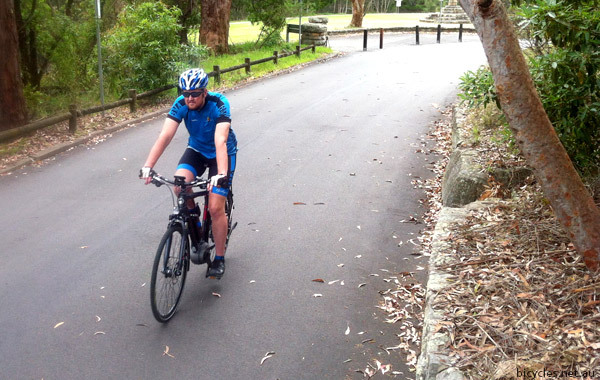 My first ride on the bike was around Lane Cove National Park because I wanted to have a go at a good long-ish climb that I was familiar with. 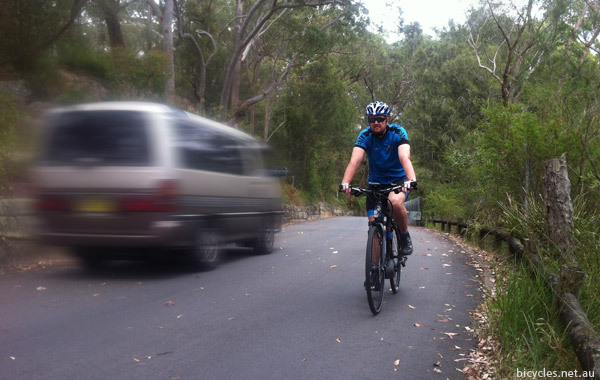 I tested the bike at the bottom of the valley and it was as easy to use as Rick from Eurocycles said it would be. Turn the display on, wait a couple of seconds for the system to calibrate, and when the 0.0 km/h popped up on the head unit, I was ready to go. The head unit is very simple to use and I put it into Turbo mode and took off. I was told before I rode the bike that you had to leverage the gears, and this was very obvious when I started climbing. The motor is very quiet, but there is a hum and its pitch changes as the motor strains. It’s a bit like driving a manual car in that I was listening for the right place to change gears, but it didn’t take me long to work it out. It was an exercise in maintaining cadence and pressure. Anytime I felt my cadence drop or I had to do more work with my legs, I changed the gear. I did 3 repeats up the climb and by the second one I was pedaling and changing gears very smoothly and able to maintain a pretty consistent rhythm and intensity without dropping lots of speed. I was impressed. The Alboin is not a motorbike; like all well constructed e-bikes it is designed to respond to the effort that you put in. 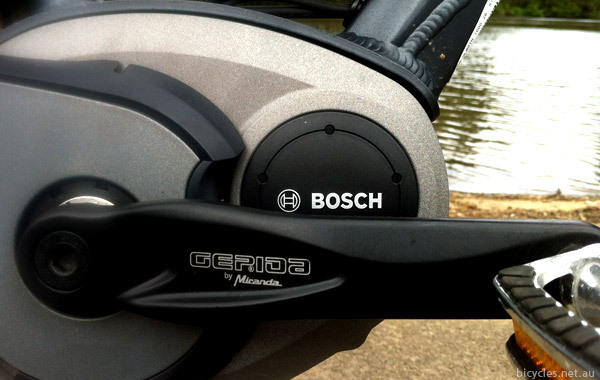 The Bosch motor uses sensors on the cranks and wheels to determine the amount of assistance to give and helps you to pedal by driving the chain ring while you do. I don’t want you to get the impression that the motor turns the chain ring by itself, because it doesn’t, rather the location of the motor means that it’s in a position to directly assist your pedaling. Some numbers will help explain this. The Alboin has 4 pedal assist modes; Eco will give you an extra 40% power when you’re going at your maximum, Tour mode will double your power output (i.e. 100% extra), Sport will give 150% of your power, while Turbo will give you up to 225% of your power. You’ll notice there that I have written “of your power” several times, and that’s exactly how it works; the more you put it, the more you get out. If you want more assistance from the motor, you pedal harder, or to state it more obviously, when you need to pedal harder (e.g. going up hills), you’ll have more help. As I said before, it’s not a motorbike, it’s a pedal assist e-bike. 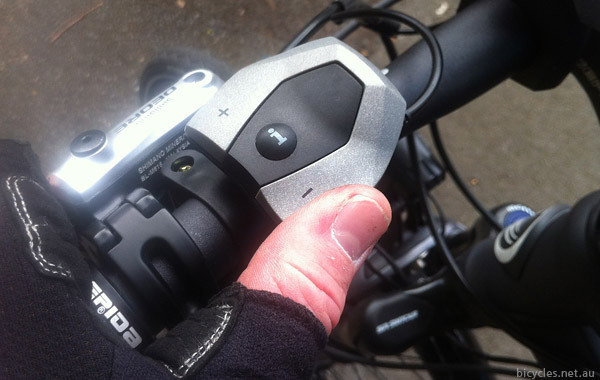 Having this variability and selection of modes means you can customise your ride. The Turbo mode will, with a full battery and giving maximum assistance, give you around 50km worth of work. Switch that to the Eco mode and your battery life extends to over 100 km. Obviously you get a lot less assistance on Eco mode compared to Turbo mode, but it means that you can conserve your battery life. The display unit will keep updating your distance to “empty” based on your current riding profile since the battery life is only relevant if the motor is actually being used; in Australia the motor has to cut out at a speed of 27 km/h, which the Alboin does. This means that if you ride over that speed the motor won’t be assisting you. I tend to ride at about that speed on average on my commutes, and this is how I used the Alboin for the week I had it. When I was on the flats, the motor helped me to get up to the cut-out speed and then kept me there if I fell below it. Despite the weight of the bike, it rides very well without the motor operating and exceeding 27 km/h was quite easy for me since I didn’t have to use a lot of my own effort to get there, I only had to maintain it. The Alboin is geared in a 1 x 10 configuration and has enough low gearing to get you up hills without the motor if required. The only place where it’s lacking is at the higher end; I found myself riding a lot on the smallest cog and wishing for a few more teeth on the front. As I found out on my first ride, it’s when it came to the hills that the motor made a huge difference, and that’s probably the best reason to ride an e-bike. The Alboin doesn’t do all the work for you, but it does iron the hills out. I can probably explain that better by explaining the cognitive dissonance I felt when I was riding it. When you’ve been riding for a while you get to know the relationship between your gears, your cadence, and your terrain. When you’re riding the Alboin, however, that relationship is all messed up. You know from long experience that you are putting in the effort to do a certain speed, but you look at the speedometer and you’re going 5, 7, 10 km/h more than what you thought. It’s like one of those days on the bike where everything feels great and it’s all working for you and you can’t believe how well it’s all going, except that with the Alboin you have it every time you ride. In the week I had the Alboin I had two thoughts for improving the experience. The first was that there should be a dropbar version of the bike, simply because I prefer drop bars. The second thought was that, since the motor is getting power information from the cranks, I’d really like to see that on the display, then the bike can be used for training and you could, for example, compare motor power to leg power on various parts of your trip. Rick from Eurocycles smiled slyly as he gave me an information package on the Gepida bikes. Yes, the Alboin is available in a dropbar version. Yes, you can get power information from the motor, and so much more. The Alboin uses the Bosch Active Line group set (motor, battery, head unit), but some models use the Performance Line group set and the performance line group set has the Nyon head unit, which will display everything you need on your ride (power, speed, maps, etc.) and will automatically sync with your smart phone or to your home network via wi-fi. I don’t have enough space here to explain the coolness of this system, so have a look for yourself. And the best part is that this system will fit onto any of the Gepida e-bikes. I’ll make a final comment about e-bikes in Australia before I conclude this review because Rick did a very subversive thing and gave me a Gepida brochure that was printed in German and written for the German market. My German is a little rusty, but one thing I did understand is that, in Germany, the Bosch motor cuts out at 45 km/h. That’s forty-five kilometers an hour! In Australia the motor has to cut out at 27 km/h. I’ll let you decide whether that’s good or not. (Publisher’s Note: The distributor, Euro Cycles points out that regular 250w e-bikes in Europe also cut-out at 27km/h. Speed-pedelecs (s-pedelecs) which are limited to 45 km/h also require registration as well as equipment such as a rear-vision mirror, kickstand and more). If you’re going to buy an e-bike, either adapted or integrated, or you’re just thinking about it, I would advise to only look at the bikes from the countries where e-bikes have gone through multiple generations and where there is an active and competitive market. If you’re going to buy, buy from a company with a solid reputation, that uses the best parts, and that has a commitment to their customers. Any of the Gepida bikes are well worth looking at, and the Alboin 1000 is an excellent all-round commuter that won’t disappoint. 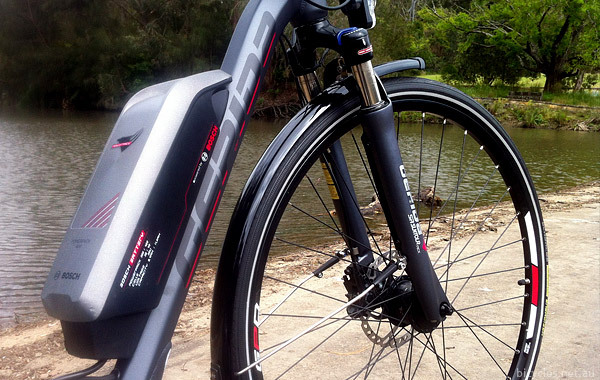 The Alboin 1000 retails for $3950 and the Gepida range are distributed in Australia by Eurocycles. 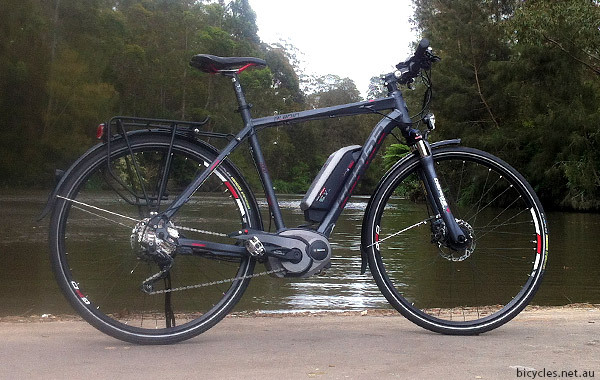 Gepida e-bikes are available from specialist e-bike retailers and local bike shops throughout Australia; if you don’t have a Gepida stockist nearby, give Eurocycles a call and tell Rick that BNA sent you.